My company is about to do some hiring. I am a very busy man, but I make it a priority to let other things suffer so I can be completely involved in hiring the best people available. I’ve seen more than my fair share of good résumés, probably totaling dozens over the decades. I have a knack for sizing up people based solely on their answers to my “strategic” questions during a thirty-minute. I can predict the success of applicants. I don’t waste valuable time researching an applicant’s character or passion. I hire right away once my highly selective criteria are met. These qualities make me great at hiring. Résumés are a waste of time. They lie about the applicant’s GPA, work experience, and how their objective magically lines up with the plaque on the wall (you know, our “missionary statement” that we have just because all companies have to have one). 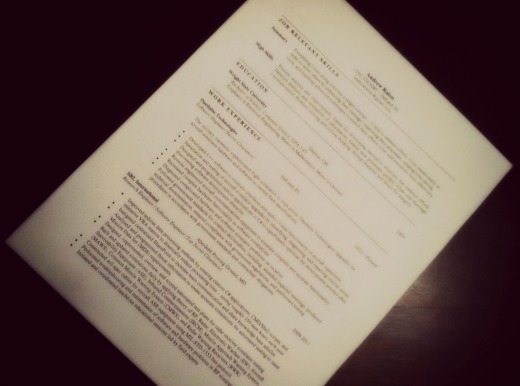 Résumés make the applicant seem awesome and smart and perfect for the position. Even though I know he is lying, I want people that are great at sales, no matter the cost. The better the applicant can lie his way into being hired for the position, the more I want him on my team. Other than that, I use the résumé to see if he formatted it to my preference. I glance over it, as someone else has probably already studied it (this is just one of the many ways that I save time). The questions I ask are not related to his experience or interests, so it doesn’t matter much what’s on the paper. Interrogation is the next method I use to find the perfect applicant. My questions are a series of riddles that tell me if the applicant can think through an odd, irrelevant situation to find “the absolute correct answer” in my mind, which will vary based on my judgment of the applicant. This way, I can see what how he will react when placed under pressure in an awkward situation with an irrational person demanding brilliant solutions to stupid scenarios. His response is prophetic of their success on my team. Speaking of prophecy, I enjoy peering into the future to imagine how well I would do in his situation. How would I do at this job if I wore his shoes? I would probably do fine — they look pretty comfy. What about if I drove his car? I’d probably want a BMW just like the one driven by my potential future boss. How awesome would I be at this great company with an excellent boss as a mentor? I’d do excellently. I mean, who wouldn’t do well under my his tutelage? How much of a jerk would I be if I had that disgusting nose? Hey now, it’s just a nose; no need to make rash assumptions. These answers come to my subconscious and help me know without a doubt of a shadow if he is right for the job. I used to spend time researching the person, having him in for multiple interviews, taking him out to lunch, calling references, speaking to former employers, and running background checks. Largely, that is all pointless! If he is good at lying, so are the people who I will ask about him. His references will attempt to ruin his opportunity to work for me out of envy. His former boss is lying because he is upset that his greatest employee left him high and dry to be fiercely loyal to my team. So is the ex-girlfriend, the one with the blog working out her emotional scarring from his apparently failed relationship with her. I would be scarred from breaking up with someone that awesome, too. You cannot let these character references throw you off the scent. Lastly, I’m great at realizing that he is a good fit. I determine that he has the ability to do the work. (I can always teach him to have the desire to do it later on.) I check that he has the proper experience, which is verified by the correct words on their résumé. I prophesy that his interviewing skills automatically translate into how well he will do the work. I confirm that he at least hints that he is vaguely interested in the work. If he has gotten this far into the half-hour interview without leaving out of frustration, I hire him.